The Sudbury Catholic District School Board is committed to the development of the whole person and to providing a total education — spiritual, physical, intellectual, emotional and social — in which the true worth of each person is recognized and promoted. The Board is committed to maintaining safe, inclusive and accepting schools and workplaces, free from violence, harm and disruption. Building a positive and inclusive school climate requires a commitment to developing healthy and respectful relationships throughout the whole school and community, among and between students and adults. See the St. David School Bullying Prevention and Intervention Plan. A code of conduct promotes responsibility, respect, civility, and academic excellence in a safe, inclusive and accepting learning and teaching environment. These standards of behaviour apply to students whether they are on school property, on school buses, at school related events or activities or in other circumstances that can have an impact on the school climate. They also apply to all individuals involved in our Catholic schools: principals, teachers, other school staff, parents, volunteers and community groups. If anyone has information on a potentially harmful or unsafe situation in a Sudbury Catholic District School Board school (weapons violations, drugs or alcohol, bullying, etc. ), they can anonymously report it here. The report will initiate immediate and appropriate action. Before submitting an anonymous report we encourage you to consider speaking to a parent/guardian or other trusted adult, such as a school teacher, educational assistant, or principal. If speaking to someone directly is not an option, then we want you to know that you can confidentially and anonymously report unsafe situations here. Please remember that unless you elect to provide your name and contact information with your report you are not identified when you send a message. The more information we are given, the more quickly we can respond and the more help we can provide. Please provide as much information as possible. Anyone who would like to leave a call back number/email, or his or her identity, is encouraged to do so. If you are reporting a cyber bullying tip on violence or harmful acts, we ask that you provide as much specific information as possible (i.e. web address, screenshot). This will help us ensure the safety of all students and staff. 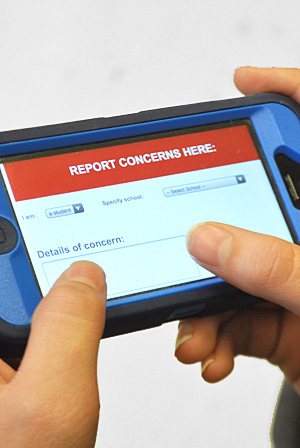 Always remember, if you need to report an emergency, call 9-1-1. And if you would like to talk to someone to help support you, call Kids Help phone at 1-800-668-6868. We can only respond to issues that we know about! AND SCHOOLS AND KEEPING THEM SAFE! For the purposes of the definition of bullying in subsection (1), behaviour includes the use of any physical, verbal, electronic, written or other means. (a) creating a web page or a blog in which the creator assumes the identity of another person; (b) impersonating another person as the author of content or messages posted on the internet; and (c) communicating material electronically (e.i. text messaging, snap chat, instagram, etc.) to more than one individual or posting material on a website (i.e. facebook, twitter, etc.) that may be accessed by one or more individuals.